As I write on my blog, I wonder what it is others want to read about. So I thought I would write about what I would be interested in and hope you agree. When I build a cake, I imagine what the insides of the cake should look like and start with the structure. I want to share some of my tips in putting together this amazing 3-D Longhorn. 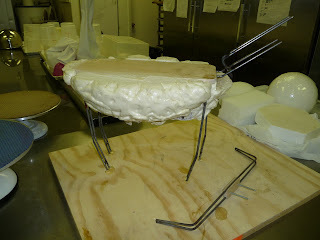 Here is the structure that I started with and putting foam under as the belly and carving it to the desired shape. It is now time to form the legs, horns and neck with rice cereal treats. I suggest you grind your cereal treats fine before adding in the marshmallows and butter. This will allow a smoother finish when molded. 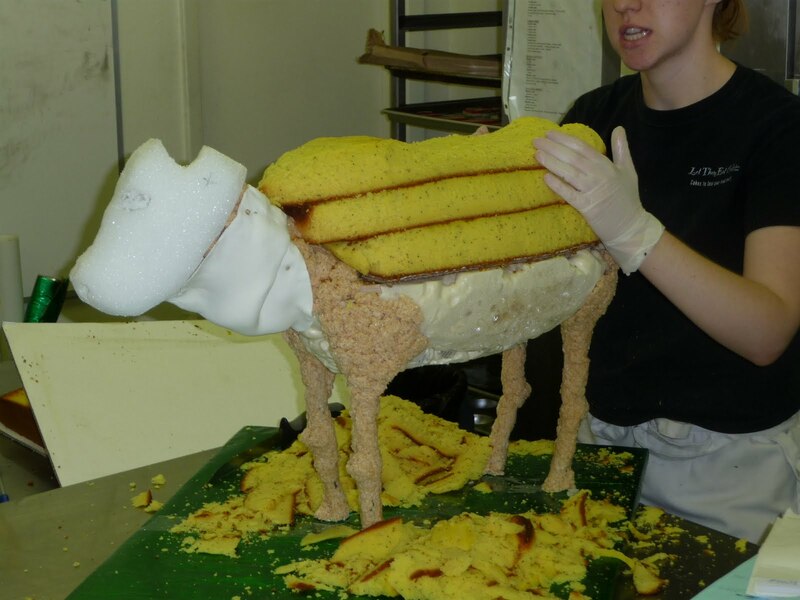 The head is carved out of styrofoam and gumpaste is added around the neck to add the look of skin. Cake is now added on it's own board and carved to the shape of the Longhorn's body. The cake is filled and covered lightly with buttercream as a crumb coat. The cake is now covered with a final coat of buttercream in white and brown. 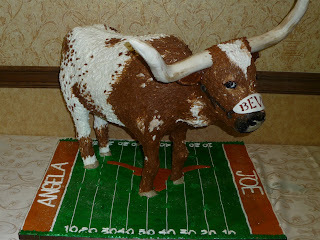 The image the client gave us of the Texas Longhorn's mascot, BEVO, is now replicated onto the cake. We use a paint brush to achieve the Longhorn's hair which you can not achieve with Fondant. To finish the cake, the board needs the final touches to coordinate it to the event. I decorated it as a football field with the Texas Longhorn's logo and the bride and groom's names in the end zones. Cake delivered and what a reception. The Groom's cake had more attention than the wedding cake even though the wedding cake was beautiful. Starting in June, Let Them Eat Cake, Inc. will be holding cake decorating classes. Please call to sign up. First come, first served. Classes must have 5 students minimum for the class to hold. I will be teaching BASIC DECORATING TECHNIQUES, FONDANT WORK and SCULPTING CAKES. They will be 2 day classes from 6-9pm on Wednesday and Thursday nights in June, July, August and September 2010. I will also be holding one day workshops and mother/daughter classes (to be announced) Everything is included. Please check out the website under EVENTS: www.LetThemEatCakeAz.com and call 602-952-5272 to reserve your spot. Truly a blast! We look forward to your call. Owner,CEO,Lead Decorator/Designer of Let Them Eat Cake, Inc.
Let Them Eat Cake Inc. - edited by ComputerWonk. Powered by Blogger.. Simple theme. Theme images by suprun. Powered by Blogger.